It was a very, very subtle exhortation tweeted by the Rt Rev’d Paul Bayes, Bishop of Liverpool. 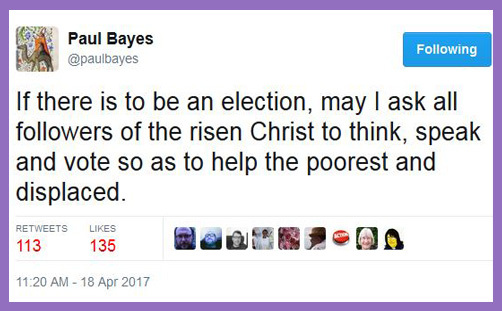 So subtle, in fact, as to be (he would insist) a totally undetectable expression of political bias, and so no predilection at all: what possible partisan posturing could there be in a tweet which encouraged Christians to vote for parliamentary candidates who will best help the poor and dispossessed? Innocent face. Isn’t that what Jesus would do (for those who believe he’d cast a vote for any one)? Pious face. Isn’t that what God requires of all believers in a liberal democracy? Self-righteous face. The Bishop tweeted just minutes after Theresa May had announced her intention to hold a General Election on 8th June (or put the proposal to Parliament, since she has to circumvent the mildly-inconvenient Fixed-term Parliaments Act 2011). It’s good when Church leaders are on the political ball and attentive to current affairs; always prepared to seize every opportunity to witness of the hope there is in Christ. Even better when they’re as sharp as a tack and can turn every event to the service of the Lord. The Bishop of Liverpool’s tweet is actually an exhortation to vote Labour or Liberal Democrat (or even SNP). He’d deny it, of course, but it’s a plain as day for those who have eyes. Is this observation some sort of own-goal admission that Tories don’t actually care about the poor and displaced? Only if you’re obtuse, or as maniacally partisan as Professor AC Grayling. The point is that Paul Bayes has never praised the Conservatives for their treatment of the poor or their provision of aid to refugees. Indeed, pace Justin Welby, no bishops have. They have instead routinely condemned the Prime Minister for not taking more refugees, and chorused their disapproval of (for example) the welfare reform initiatives of Iain Duncan Smith. Benefit cuts and caps of £23,000 and the ‘bedroom tax’ are draconian and inhumane: they need Jeremy Corbyn (or Tim Farron) to inject some Christian socialist compassion into the system for greater social justice and equality. So when the Bishop of Liverpool tweets about the need for “followers of the risen Christ to think, speak and vote so as to help the poorest and displaced”, he is actually urging believers to vote for change: the status quo, he posits, is manifestly not the best option for the starving, homeless and outcast. Tories just don’t care about the poor. In fact, the Conservatives have long focused on helping the poor by addressing the root causes of poverty, such as family breakdown, failing schools, chronic joblessness, debt and drug/alcohol addiction. No matter how many £10,000s you hand out to drug-addicted single mothers or drunk and abusive fathers, it is no remedy at all if it doesn’t raise them out of squalor and offer them and their children the hope of life and living transformation. You might think a bishop would understand that, but too many of them seem to be locked in a paradigm of 1970s statist socialism, where the optimal expression of Christian compassion is for welfare to be limitless and all moral judgment suspended. Everyone has the ‘right’ to a house, a job, free comprehensive education, free childcare, free universities, a real living wage and a pet unicorn. Personal responsibility, life choices and their consequences don’t come into it. People have rights, and they are right. End of. And this callous government needs to take more and more refugees and migrants from the Middle East, for that is our moral duty. Our borders should be completely open, like those of Germany. It is the hospitable and Christian thing to do. Pictures of dead babies on a beach appall everyone except those heartless Tories. This screaming human tragedy needs a change of government which is capable of weeping with bereft mothers and willing to offer sanctuary for the healing of a million traumatised souls. What jobs do they do when they get here? Where are their houses? What language do they speak? What do they eat? What school do they attend? What healthcare must be provided? How many of them must die on the perilous seas at the mercy of human traffickers who take Angela Merkel at her Christian and generous word? Can Europe really accommodate millions of displaced Iraqis and Syrians while sustaining social harmony? The UK (that is this Conservative government) has pledged more than £2.3 billion to support those affected by conflict in the Middle East – the country’s largest ever response to a single humanitarian crisis. The UK (that is this Conservative government) is the third largest bilateral contributor to the humanitarian response in Syria, and the second largest overall since the start of the response in 2012. The money is being spent on the ground, helping people to live and restore their livelihoods in their homelands, where the majority would prefer to remain. Are we really helping war-ravaged nations build a future by offering their fittest young men (and they are most often men) a new life in Europe? Who is left to build the new houses in Aleppo? Who will teach their 8.4 million children? Who will pluck out bad teeth and mend broken bones? If we take a country’s richest and fittest (for it is generally only they who can afford to pay traffickers and walk hundreds of miles), are we not denying basic services, protection, security and sustainable opportunities to the poorest and most vulnerable? Followers of the risen Christ will surely weigh these issues carefully and prayerfully, as the Bishop of Liverpool exhorts. And they will consider that this Bishop advocates a second referendum to overturn Brexit; believes a vote for Trump (and Brexit) to be ‘bowing the knee to hate‘; and is viscerally opposed to grammar schools. No, his tweet is not a neutral democratic exhortation for Christians to discern how they may vote; it is a call to oust Theresa May from No10 and cleanse the land of right-wing extremists, which all Brexit-believing, grammar-school-supporting, welfare-limiting, migrant-capping Tories surely are.